Emerson in beautiful swirled ivory Plaskon. 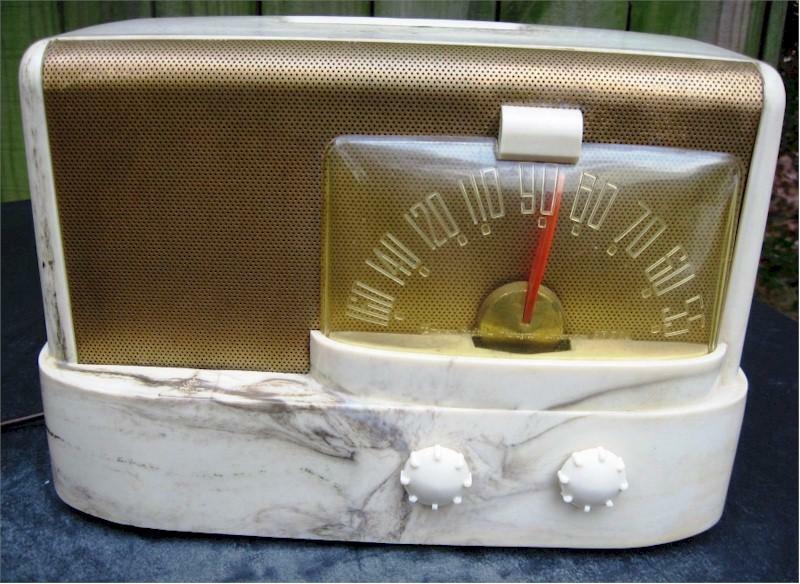 This radio design is attributed to famous industrial designer Raymond Loewy, who also designed the Studebaker automobile. This radio came in about five variations. This swirled ivory Plaskon case is very dramatic and near mint, with no cracks, chips or hairline cracks. The gold mesh grille is excellent, and the dial cover is clear & not warped. The chassis has been checked, and the radio is playing well, picking up all my local stations with no annoying filter hum. The dial light flows down from the top of the dial in a warm glow that lights up the dial. An excellent example of a radio designed by one of America's great designers. 11"W x 7-1/2"H x 6"D.
You are visitor number 2,324 to this page.